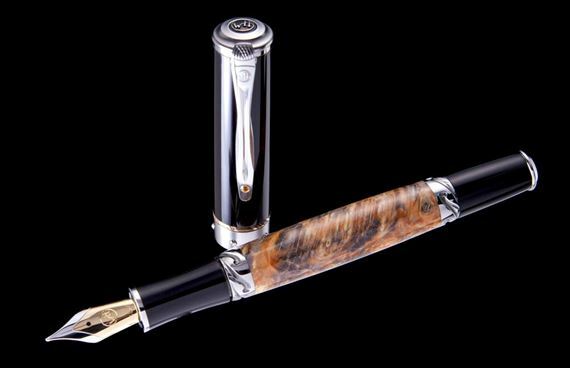 Order your William Henry Limited Edition Cabernet Box Elder Burl Fountain Pen today from FahrneysPens.com. Fine Pens, Refills & Luxurious Gifts – great prices & fast shipping. 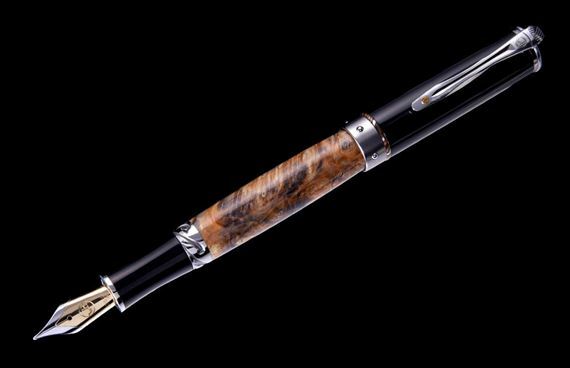 The F8-6 Cabernet is a beautiful fountain pen featuring a barrel in box elder burl wood, and a light structure in aerospace grade titanium and aluminum. The German-made nib is in 18K gold, the accents on the carbon fiber cap are in Mokume Gane and the pocket clip is set with citrine. This beautiful writing instrument also features William Henry's patent-pending Wavelock™ cap closure system – a ring of chromium steel balls embedded in a titanium ring which are captured in wave-shaped grooves in titanium collars for closed and post positions. The F8-6 is a limited worldwide edition of 100 pieces, and the exotic wood barrel confers to each of them a distinct and original personality. Much like their owners, no two pens are ever alike.